Co-op adventuring, lots of cubes. A new cube-based challenger has appeared! 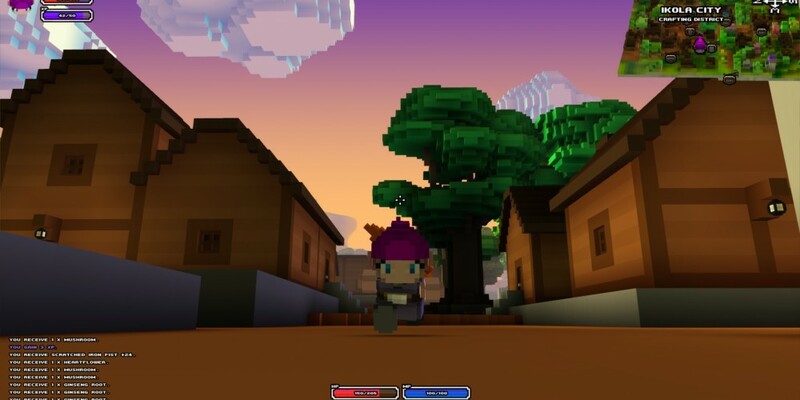 Cube World recently launched its alpha version, bringing a much more focused RPG design to the ever-expanding genre of games built with cubes. If you're worried this is some sort of Minecraft clone, we're pleased to say that couldn't be further from the truth. Think of Cube World as a curious concoction of games like The Legend of Zelda, Monster Hunter, Minecraft and Secret of Mana, all of which are cited as inspirations by the game's creator Wollay. You pick and customize a hero who inhabits a procedurally generated landscape packed with variable terrain, unique biomes, towns, cities, quests and so much more. You'll encounter roaming adventurers, befriend pets, gather flowers and craft potions. All of this is couched in an RPG shell that encourages you to upgrade equipment, level-up your hero, and turn yourself in to a supremely badass explorer/warrior. There's a lot to love about Cube World, but co-op play is perhaps what makes it so enticing. Join with a few friends as you form your own party of adventurers, taking on your procedurally generated world's challenges as a team. The feeling of roaming the countryside and having the freedom to do what you like is very strong in Cube World. That, and the closely related feeling that you want to club those stupid rock monsters to death while they sleep. Hate those guys. Cube World is technically available to purchase at this time, but the website has been having some serious issues over the last few days. As a result, registration and purchases are switched off and on throughout the day. Wollay has promised fixes are in the works, so in the meantime head over to the website, salivate over the current and planned features, then hope you get lucky. Page created in 1.5658 seconds.